As hard as it may be to believe, Cam Fowler understands what it's like to deal with adversity in sports. Watching the defenseman this season with the Windsor Spitfires and the U.S. at the World Junior Championship, Fowler stood out for his silky-smooth skating and skill and his smarts moving the puck. He's ranked No. 5 on NHL Central Scouting's final list of North American skaters for the 2010 Entry Draft, scheduled for June 25-26 in Los Angeles. "He's your prototypical offensive-defenseman," NHL Director of Central Scouting E.J. McGuire said. "He's your (quarterback) on your (power play), he's your great skating offensive-defenseman and he controls the puck with his skills. If you're looking for a comparison, think of (Tomas) Kaberle with the Maple Leafs. But in sticking with his country, maybe even a future (Brian) Leetch or (Phil) Housley." Cam Fowler got to pull off a rare double this season – he won championships with the U.S. at the World Junior Championship and the Windsor Spitfires at the Memorial Cup. And he wasn't just along for the ride, either. He had 2 assists and a plus-8 rating for at the WJC, and was seventh in the OHL for scoring by a defenseman with 55 points in 55 games. Winning gold in Saskatoon, he said, was the product of more than two years of hard work, dating back to his days at the U.S. National Team Development Program. "It made it that much more special for me because I had played with a lot of those guys for two years and they were brothers of mine on the team," Fowler told NHL.com. "Winning in dramatic fashion, in Canada, to stop the Canadians' five-year streak is something I'll never forget. Standing on the blue line, getting to sing your national anthem -- that's a feeling that can't be described. One of the better memories I'll ever have." Helping Windsor in his first season there become the first repeat Memorial Cup champion in 15 years was special in a different way, he said. "I had been battling with those guys all year. I think it's something special when you are the team that's supposed to be knocked off, you're the defending Memorial Cup champs, and you can go in the second year and do it again because everyone's gunning for you. I was really proud of the guys and was really happy for the guys that were able to do it two years in a row. I was only there for this year, but it's still a great accomplishment." Fowler said he couldn't rank one title ahead of another. "I'm blessed to be able to win both in one year," he said. "Not many guys can say that. I've found myself in great situations around a lot of great players and a lot of great coaches. I'm happy with this success I've had." 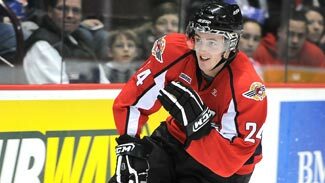 "His puck movement is excellent," Chris Edwards, Central Scouting's OHL scout, told NHL.com. "He sees the ice very well and makes hard, accurate passes. … His puck retrieval is very good, and he transitions very well to offense." As strong as those reviews are for Fowler the hockey player, scouts in a different sport might have been raving just as loudly had he chose that sport. Fowler grew up playing baseball and hockey, and continued right into his days at Farmington (Mich.) High School. "Baseball was a good way for me to get away from hockey," Fowler told NHL.com. "It was a lot different -- you get to get outside, kind of more of an individualistic sport. It was a good way for me to get away from the rink and just relax." Fowler was a shortstop and second baseman who also pitched a bit. He made the varsity team as a freshman. "I was a pretty skilled player," he said. "I think if I would have continued I might have been able to maybe get a scholarship to a Michigan (college). It's tough playing baseball in Michigan because the southern states, they get to play year-round. I might have been able to get a college scholarship in there." Fowler played baseball through his sophomore year in high school. That year, 2007, Farmington had its best ever season on the diamond, making the state championship game for the first time in school history. In the sixth inning of a tied game against Lake Orion High, Fowler was surprised to be moved from the infield to the mound. "I had pitched for my JV team that year, but I never pitched on varsity," he said. "Coming down the stretch we relied on our two horses -- they pitched every other game for us. At the end of the year both of them ran out of steam and they needed someone to step in. We had some other guys who had pitched already, and I was pretty much the last resort. I went in there, my heart was pounding, the fans were screaming, it was my first experience there. I got out of the first inning great. I had a couple strikeouts, so that was great." As smooth as the sixth inning went, the next inning saw things unravel. "I think I got the first guy out," recalled Fowler. "I plunked the second guy -- the changeup got away from me. This guy had been killing us all day. He stole second on the first pitch. I remember specifically I had the (next) guy at two strikes and the coach called for an inside fastball. I hit my spot exactly where I wanted to, I jammed him, but he just got enough of it to squeak through the hole." Fowler was left to watch as the winning run scored. As disappointed as he was, he said he still carries the lessons learned that day. "It was a great learning experience for me," he said. "I hadn't faced something like that along the way. That kind of … gave me the experience for when I would go further along down the road. The hockey experiences were going to come up. I could reach back to that situation and use it and think about how I reacted to it. Those experiences are going to happen. It's just what you take out of them that's going to help you." That game also marked the end of Fowler's baseball career. In the fall, he moved to the U.S. National Team Development Program in Ann Arbor. "I had to give it up to go to the National Team," he said of baseball, "because I couldn't balance both of them." Fowler admits he misses the game, and said he plans on joining a softball league with some friends this summer, but doesn't for a second regret picking hockey over baseball. "I do definitely miss it, but hockey is what I have a better future in," Fowler said. "It's my main goal and what I want to pursue. Sometimes you have to give things up to get what you want and I had to do that."